It’s that time of year again – the time of fresh cranberries! Over the last few years, I have fallen in love with fresh cranberries. Every October I am anxiously stalking the stores to see when I can get my hands on the first bag. Lucky for me, I did my Thanksgiving photoshoot last week, and found my first fresh cranberries of the season at Walmart of all places! Fresh cranberries are perfectly tart and juicy, and one of my favorite things to bake with every fall and winter. From cranberry eggnog bread to cranberry sauce, cranberry orange muffins… the list goes on! 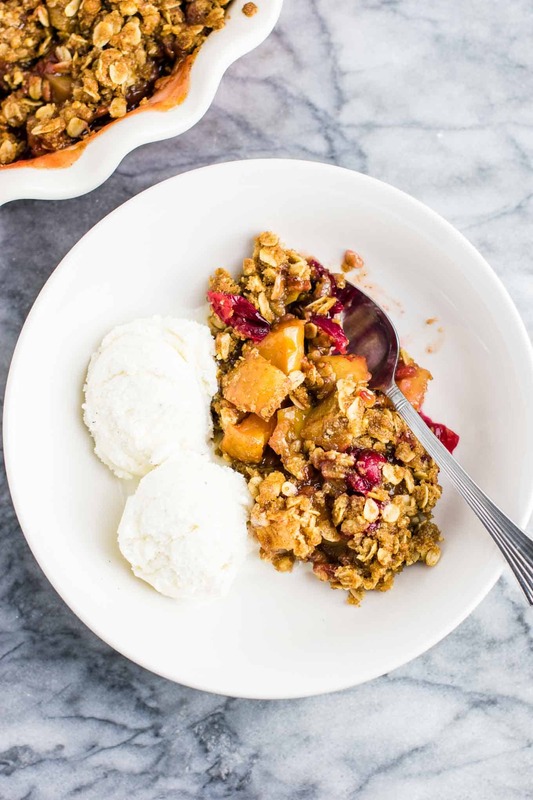 This apple cranberry crisp is very simple to make! First, you will add the ingredients for the filling to a bowl. 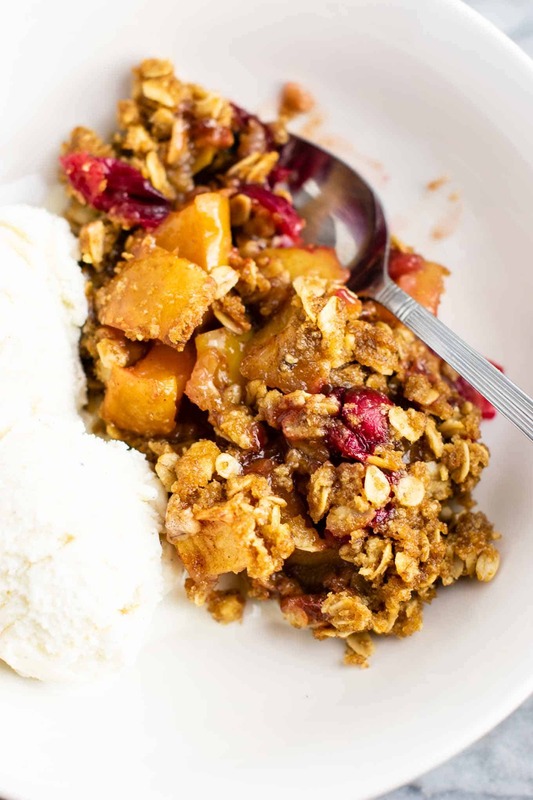 You will need: fresh cranberries, around 5 cups of diced apple chunks, sugar, cornstarch, salt, and cinnamon. Do this step first, and stir to combine. 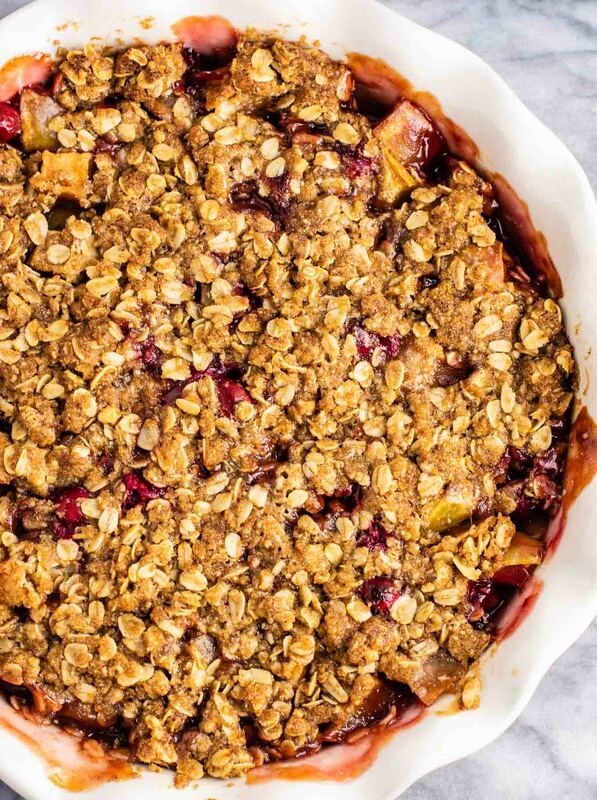 While you are making the crisp topping, it will give the filling time to get all combined. By the time 5 – 10 minutes have passed and you stir it again, it will have absorbed the cornstarch and sugar mostly. 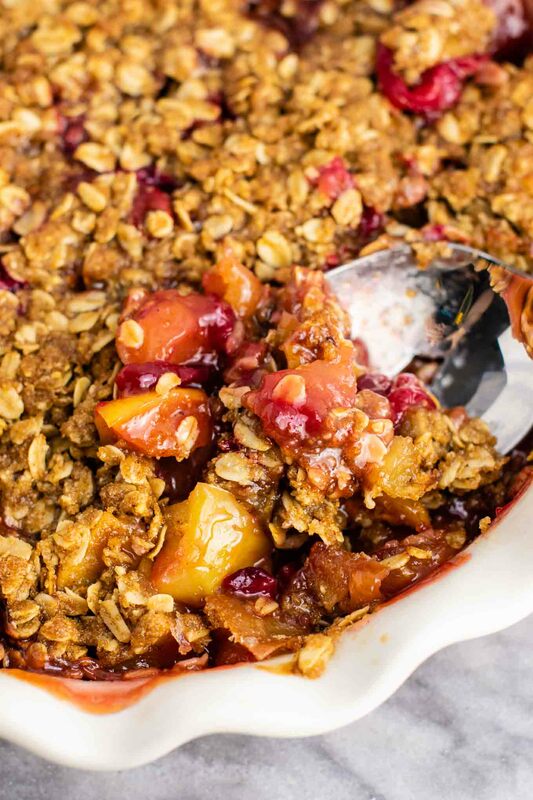 After you are done with the filling, get another bowl to make the crisp topping. For a little extra nutty flavor, I added walnut ‘flour’ to this recipe. 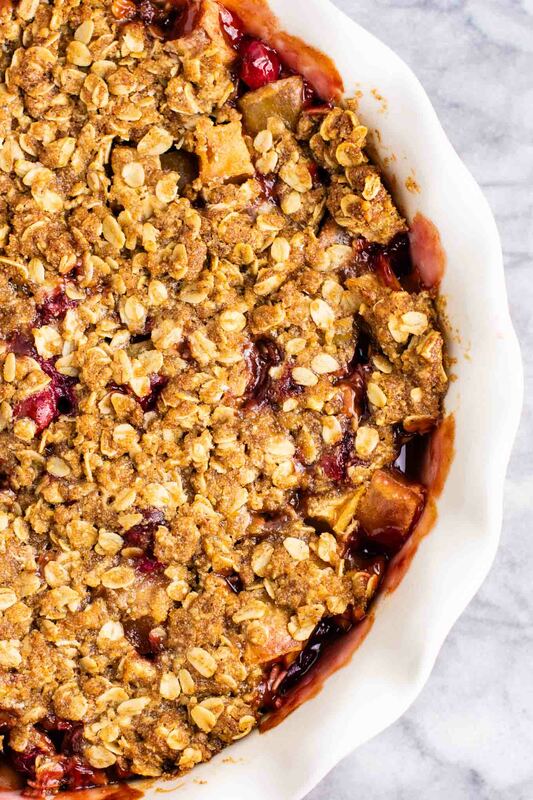 Just like in my cranberry blueberry crisp, I grind up walnuts into flour and add it to the crisp topping. 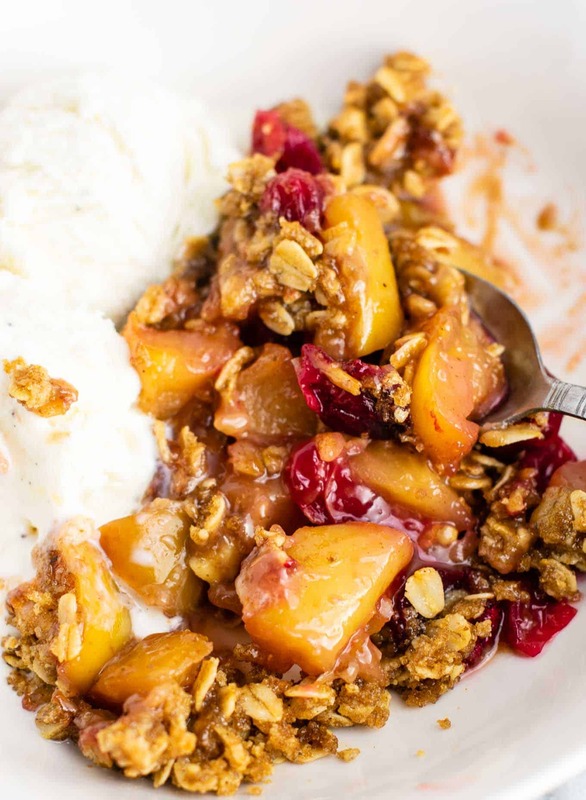 You can also substitute pecans here, like I did in the cranberry blueberry crisp. To a bowl, add the brown sugar, walnut flour, oat flour, rolled oats, and salt. Pour the melted coconut oil and vegan butter over the top of the other crisp ingredients. Stir until topping is well combined. You are ready to assemble! Stir the crisp filling one last time, then pour it into a baking dish, or pie pan like I used. Distribute the crisp topping evenly over the filling. Bake at 350 degrees for 55 – 60 minutes, or until the top is nice and browned and begins to crisp up. 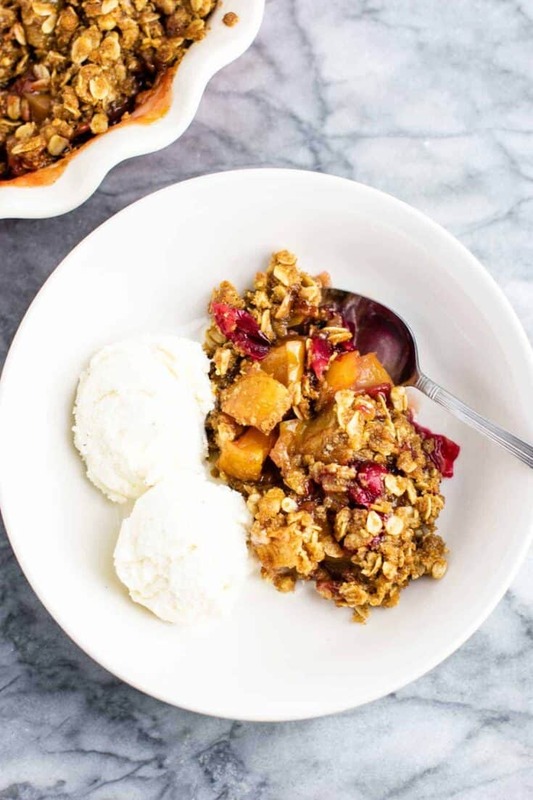 Serve the crisp hot with cool vanilla ice cream (vegan, to keep it dairy free). 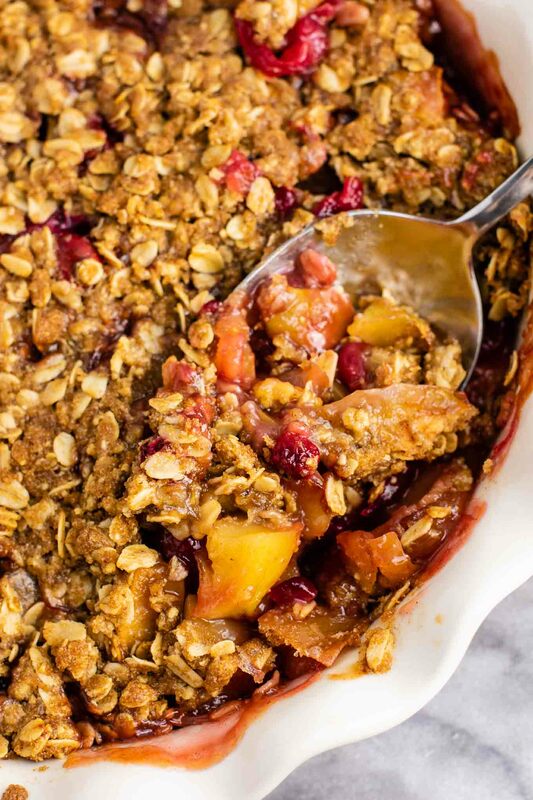 This crisp has all the flavors of fall, and is sweet and cinnamon-y without being too sweet. It was gone so fast in our house! 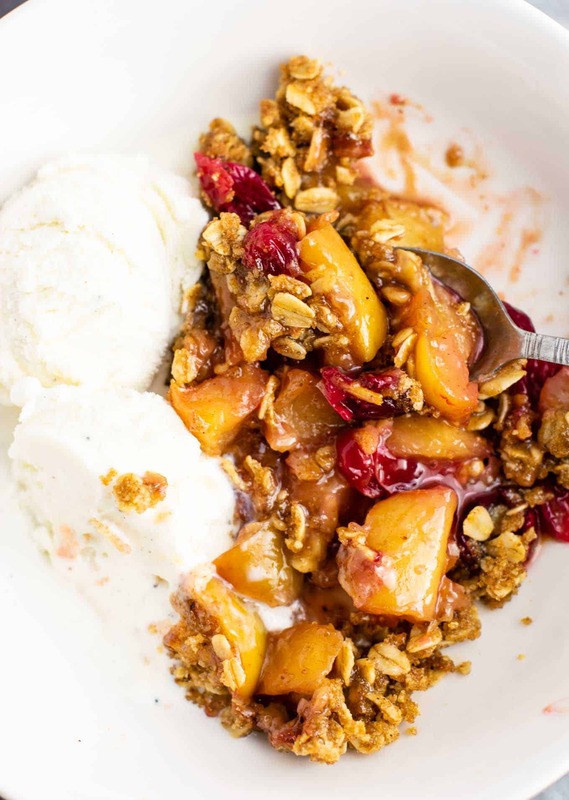 I love crisp recipes because they are so easy to make, and taste incredible with vanilla ice cream. 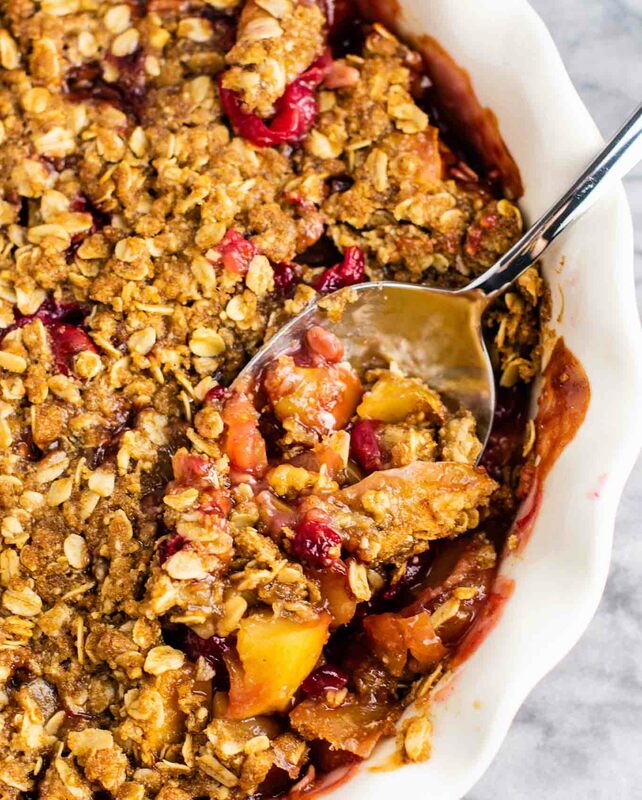 If you have never made a crisp before, you must try it! It’s a dessert that looks like a lot of work was involved, but really it’s so simple. Check out some of my other crisp recipes below! Here are some reader favorites! To a separate bowl, add the brown sugar, walnut flour, oat flour, rolled oats, and salt. made this for my husband’s birthday and he loved it! I was wondering what size the dish was that was used to bake the crisp? I used a pie dish for this recipe, but I have also made it in a small casserole dish (3 qt. I believe). Hope that helps! Can you use an alternative natural sweetener for the filling? Would you suggest honey, maple syrup, date syrup, agave ect? I have not tried it, so I am not sure that it would work texture wise and make it too runny. Maybe someone else has tried it and can chime in?